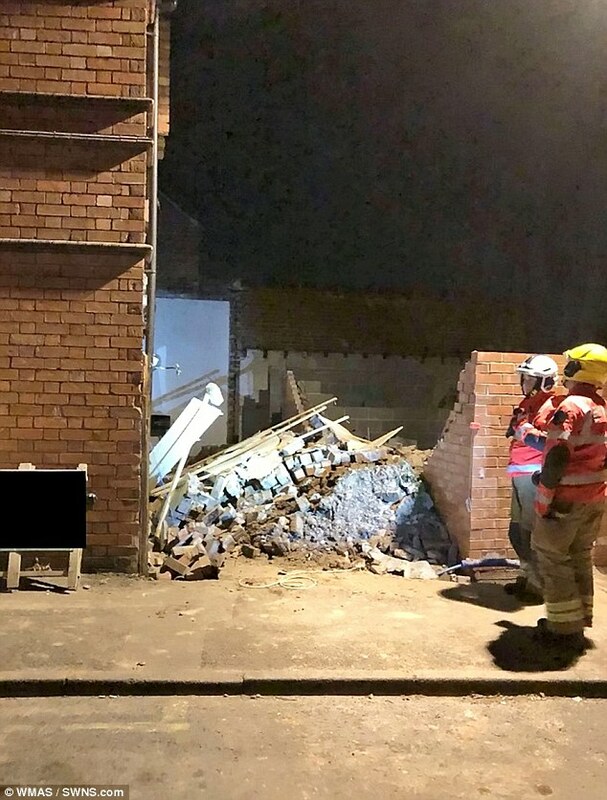 A house was reduced to rubble in the early hours of Sunday morning in a freak accident in Worcester after it partially collapsed. 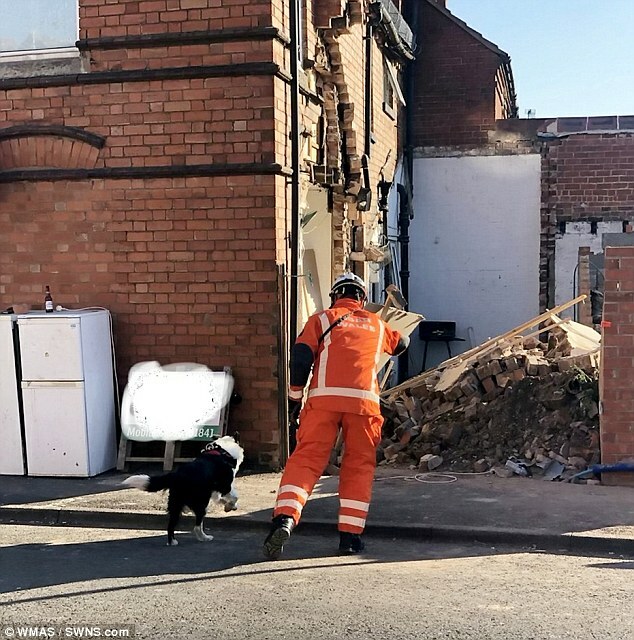 Emergency services rushed in to evacuate the entire street after the home dramatically crumbled to the ground in Mount Pleasant Road in Redditch, yesterday morning. Fire crews and police descended on the street shortly after midnight, rushing people out of their homes and towards safety. The cause of the damage is not yet known but it appears construction work had been taking place at the rear of the property. 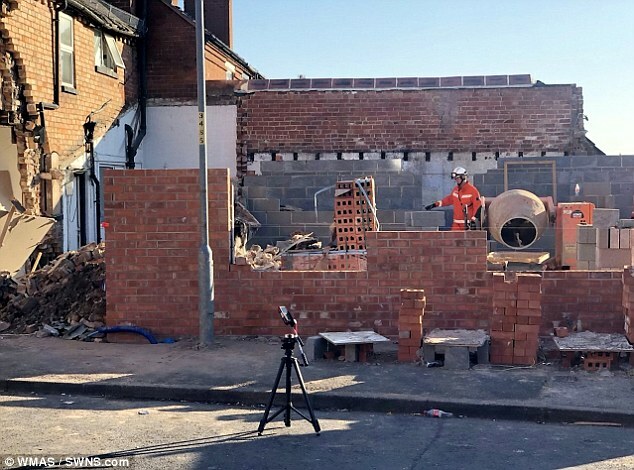 Miraculously, nobody was injured during the incident in which a chunk of the terraced property came crashing down in the garden. Dogs were sent in to look for injured people, as it remained unsafe to enter the house. A spokesperson for Hereford and Worcester Fire and Rescue Service said: 'We were called at 12.06am on July 15. 'We had two fire engines from Redditch attend, our Urban Search and Rescue (USAR) team and also our USAR dog. 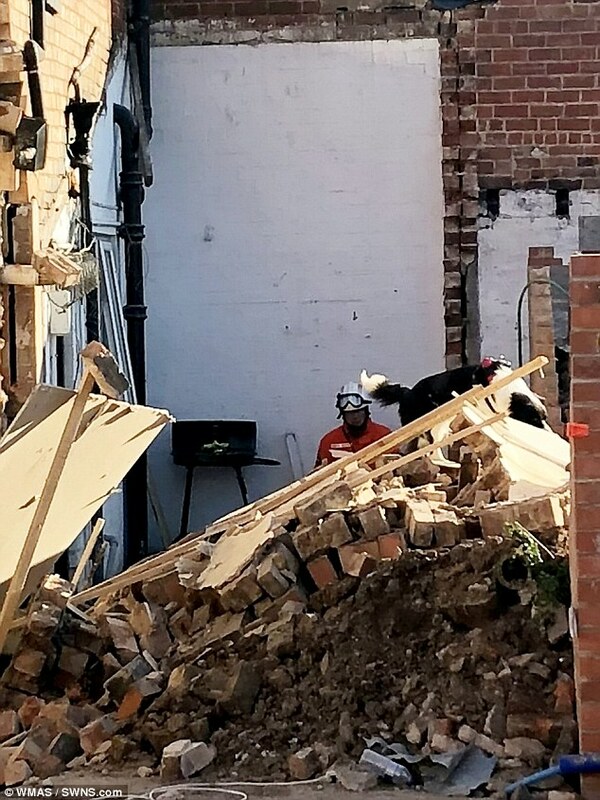 'A building had collapsed and an inner cordon was in place - and the USAR team assessed the condition of the building. 'The USAR dog checked for any people left inside but there was no indication of any persons. A West Midlands Ambulance Service spokesperson said: 'We were called at 12.11am. We sent an ambulance, a paramedic officer and the Hazardous Area Response Team (HART). 'We were called to reports of a building collapsed. On arrival we were told that all the occupants were out of the building. 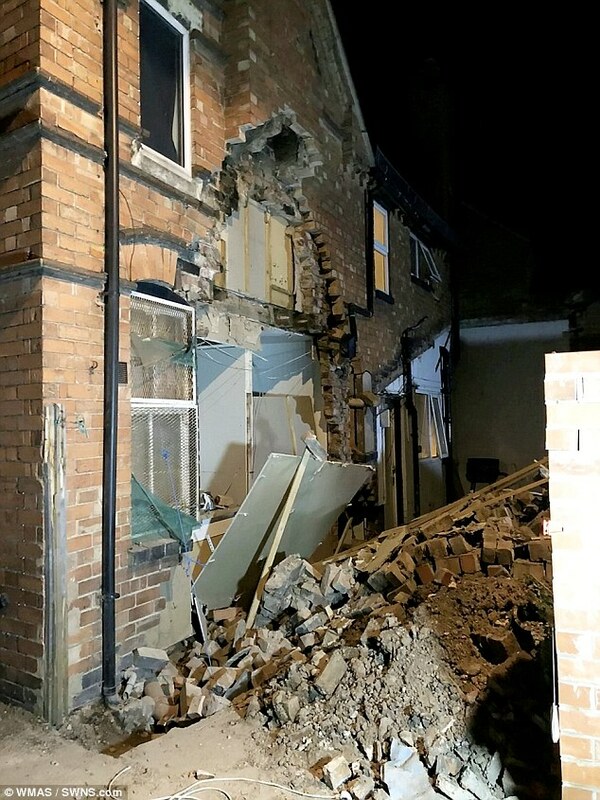 The road was closed between Ipsey Street and Salop Road yesterday, while experts investigated the cause of the collapse to ensure there will be no further damage the building. A structural engineer and gas workers also worked to ensure the scene was safe while residents were offered alternative accommodation. 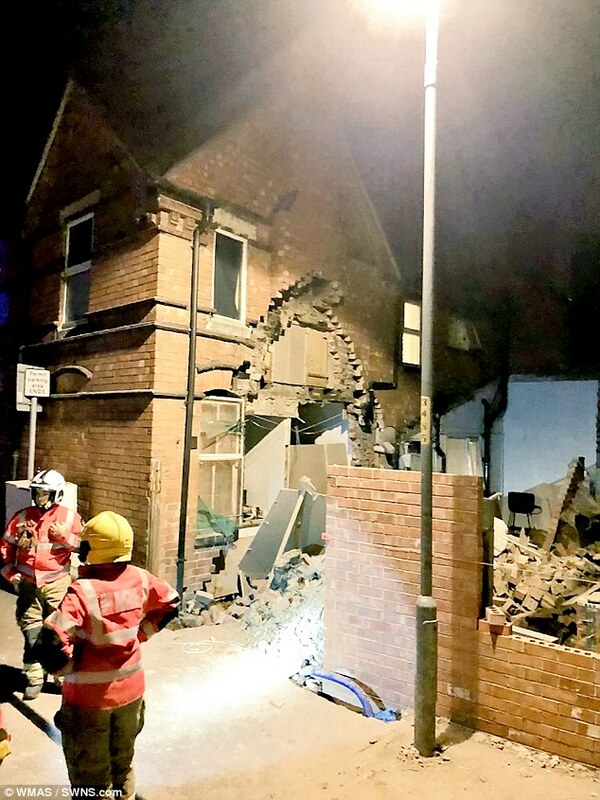 West Midlands Ambulance HART tweeted: 'Emergency services and specialist search & rescue teams responded to reports of a partial building collapse during the early hours of the morning in Redditch.